This may be the perfect Christmas Holiday trick. Imagine showing a coloring book page with a black and white line drawing of Rudolph the Red-Nosed Reindeer. 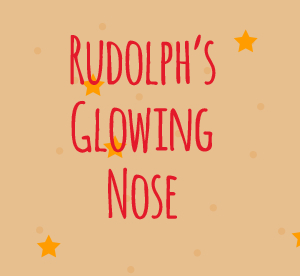 Holding it in your hands, you ask a child to blow on his nose, and suddenly it glows red! You can immediately hand the youngster the page and show your hands to be empty. Professional magician David Hira invented this trick while "on the job" at a Breakfast with Santa. He's letting AmazeKids share his idea with the magic community. This is simple, clean, and absolutely wondrous. Wait until you see the expression on young children's faces when the coloring page that magically glowed is theirs to keep! Order the free video download and we'll even send you a two pdf files (one for RH magicians, one for LH magicians) so you can print out the coloring page that's best for you. Then you can perform this right away. Is there a gimmick? Of course! But the odds are that you probably already own it. Along with David Hira as well as Josh Jay and Andi Gladwin of AmazeKids, I wish you a very happy holiday. Great idea. Can't wait to use it on Christmas Day!! Thank you for sharing.